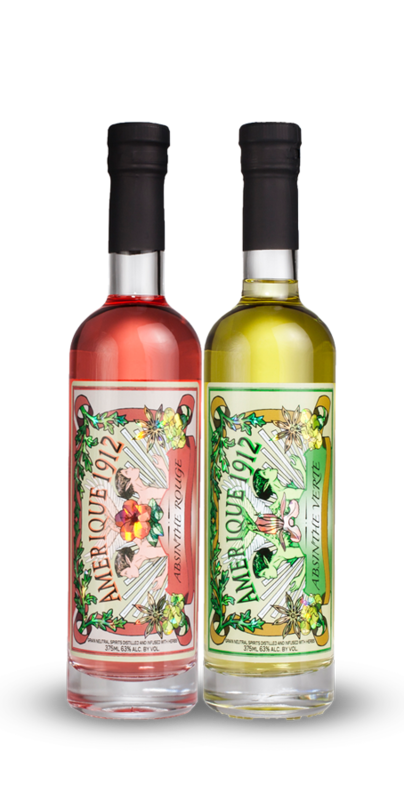 Amerique 1912 Absinthe Verte and Amerique 1912 Absinthe Rouge are authentic absinthes hand crafted in small batches in our copper potstill. Based on a pre-ban recipe they are made with anise, grande wormwood (Artemesia absinthium) and fennel as well as a proprietary blend of specially selected botanicals. After distillation, more botanicals are infused in the absinthe giving it additional flavor and, in the case of our Verte, its rich green color. Our Verte was reviewed by the Beverage Testing Institute and awarded a Gold Medal. It rated at 94- Exceptional. Each 126 proof, 375ml bottle is packaged in a tube which slows the inevitable change of color natural products experience. Drink it using the traditional absinthe fountain or try them in a classic cocktail! Recipes can be found in our Cocktail Database. Amerique 1912 Absinthe Rouge- Bronze Medal Winner, San Francisco World Spirits Competition 2011. Many people compare the taste of absinthe to black licorice, but with several botanicals used it has a much more complex flavor. What makes an absinthe "authentic"? Authentic absinthe is made by distilling anise, grande wormwood and fennel. Over the years do it yourself kits have been marketed to hobbyists in which you only infuse botanicals. Besides not tasting very good they may be unsafe for consumption. Why is Amerique packed in a tube? Our absinthe has natural color from specialy selected botanicals. These natural colors will change over time, but by keeping them in a tube and out of light they will last longer. This change of color does not affect the taste in any way. Absinthe was banned from the United States in 1912. It was believed that absinthe, because of its inclusion of grande wormwood was causing inappropriate and sometimes violent behavior in drinkers. It was believed this was caused by thujone, a compound found in grande wormwood. Thujone is not considered safe for consumption. Unfortunately it took until 2007 before testing determined that thujone does not carry over to the final spirit throught the distillation process. Federal regulators now allow the sale of alcoholic beverages made with Grande Wormwood provided the resulting spirit contains less than 10PPM of Thujone- essentially making absinthe -thujone free. Who was behind this absinthe ban? In the later half of the 19th century grape blight devastated the vineyards of Europe. The shortage of wine resulted in an increase of absinthe consumption. Once the vineyards were replanted and began producing grapes, the wine industry wanted to regain the business lost to absinthe and spread misinformation about the effects of absinthe which eventually led to its ban in Europe and eventually the United States in 1912 .